It's the biggest derby of the season, but which team will come out on top? So, first impressions? It seems like a stalemate, with both games just falling short of that oh so important five star rating. However, each game has its perks, so if your stuck in the decision making process, that's the best place to start. 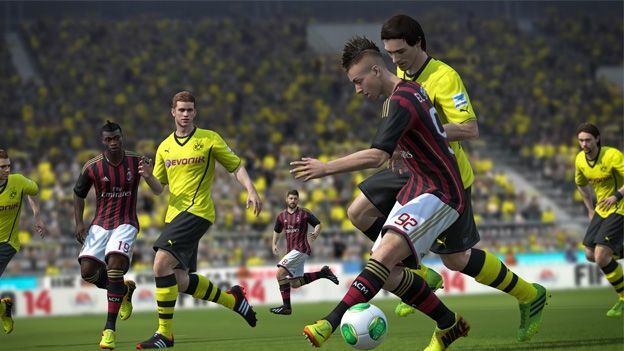 PES 2014 has unrivalled gamplay, that is both realistic and a lot of fun to play. It's not pick up and play though, you will have to get used to it. FIFA 14 also has great gameplay, plus it offers a wide array of teams licenses and little details. Basically, if you want fast paced action pick up FIFA 14, but if you want something more strategic and rewarding, PES 14 should be your choice.